Why does the RUSK Engineering Professional Straight Iron Work So Well at Straightening Short Hair? Are you a person with shorter hair that does not feel your flat iron does a good job straightening it? You know it does not have to be that way. There are many model flat irons in the beauty marketplace that work well on straight hair. One of those flat irons that always seems to get good reviews is the RUSK Engineering CTC Technology Professional Straight Iron. That is why decided it was worth taking a closer look at it. Here is what we like and don’t like about this Rusk Engineering designed flat iron. 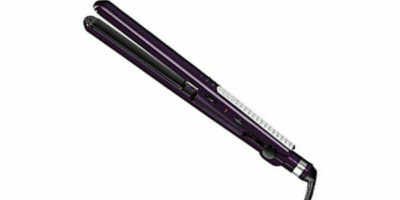 With 5 different preset temperatures, this flat iron can handle straightening short hair and many other hair types too. You can set it to work between 300ºF to 450ºF. With that wide a temperature selection even those people with very fine hair or extra-thick hair can use this flat iron. 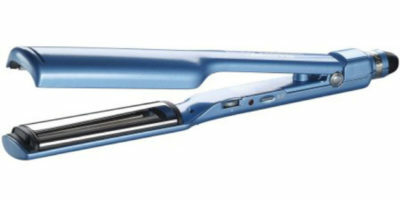 This flat iron also features a 1 ¼” heater plates. These ceramic/titanium coated plates will allow you to straighten all but the shortest length hairstyles. The ceramic/titanium coated heat plates also heat up so this flat iron is ready to use in under 60 seconds. Its proprietary Sol-gel technology helps make the heat plate surfaces on this flat iron among the smoothest you will find. Despite all its many working functions this flat iron only weighs a little over one pound. When you combine that low weight with its contoured barrel design it makes for a really easy to use the flat iron. Its push-button temp settings are also clearly displayed with a lighted background. There are two main reasons why this flat iron is great to use on short hair. The first is the fact it has titanium/ceramic coated heat plates. These promote fast and even heating that does not damage short hair when you straighten it. The other nice feature on the RUSK Engineering Professional Straight Iron that is nice to have when straightening short hair is its stay-cool Ryton housing. When straightening short hair you often need to get closer to your scalp and you certainly don’t want to do that with a flat iron that gets really hot on the outside. The warranty you get with this straightening iron from Rusk Engineering is very average, to say the least. It covers you for a period of up to 2-years from that date that you purchase it. We also had some concerns with this product. For one it has no automatic safety shutoff built into it. Even though its Ryton housing tends to stay cooler than most flat irons we still would like to see a safety shutoff designed into it. If you want to straighten your hair and it’s very short you may not want to choose the RUSK Engineering Professional Straight Iron. That’s because its 1 ¼-inch wide heat plates are a little too big to use on this short of hair. Rusk Engineering is known for making great hot hair styling products. This one of the top rated flat irons for short hair from them certainly keeps up that tradition. It has a nice variety of heat settings and its 1 ¼” barrel works well at straightening all but the very shortest of hairstyles. 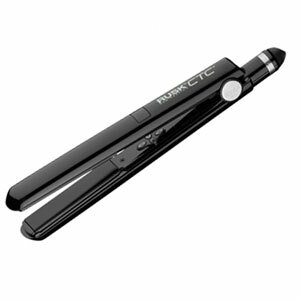 Its proprietary Sol-gel and CTC technologies really enhance this flat iron’s performance too. We all feel that the RUSK Engineering Professional Straight Iron is one that anybody with short hair can’t go wrong purchasing.